Our type 1 diabetes team was very pleased by the response to our story about immune cells in type 1 diabetes caught at the ‘scene of the crime’, which you will read about in this newsletter. The journalists we met were genuinely interested in what we are doing and asked pertinent and insightful questions about a complicated topic. Many people express their concern to me about how frequently disease stories are overhyped in the media and how this can lead to false hope for rapid progress to a cure. A young man with type 1 diabetes told me recently he felt such stories were sometimes responsible for young people not following their treatment plan because of the belief that a cure would soon be at hand. Who is at fault? The scientists excited about their discovery, or the journalists keen to get their story into the news? Possibly both, but I think this is improving and I hope it came through that our discovery is important, but just one step forward in the long path to new treatment and prevention for type 1 diabetes. Such discoveries are dependent on talented people and a recent slew of awards shows that SVI has no shortage of that. Stuart Mannering, who led the team that did the research mentioned above, was recently awarded the Macquarie Group Foundation Global Diabetes Research Innovation Award. JDRF’s 2014 Mentored Clinical Researcher Fellowship was awarded to Bala Krishnamurthy, a clinical endocrinologist in the Immunology and Diabetes Unit. Sophie Broughton from the Structural Biology Unit (who you may remember as recipient of the 2014 SVI Women in Research Award) was awarded the Christina Fleischmann Memorial Award from the International Society for Interferon and Cytokine Research. Finally, David Ascher, also from Structural Biology, won the TJ Martin Award for best PhD thesis on the St. Vincent’s campus. At a time of enormous challenges for research funding – especially for younger scientists trying to establish themselves – this is a great reminder of the underlying excellence of our teams. Our researchers are now preparing applications for two new Federal Government funding opportunities for important diseases. One is Alzheimer’s Disease, for which the Government has committed $200m in its Boosting Dementia Research Initiative. The other is type 1 diabetes, which has received $35m for a Type 1 Diabetes Clinical Trials Network. In both cases SVI researchers will be applying as part of broader collaborative teams. This highlights the importance of teamwork – something that researchers have appreciated for a long time, but which is now being actively encouraged through innovative funding mechanisms. SVI alumnus Dr David Ascher was presented with the 2014 TJ Martin Medal at the Aikenhead Centre for Medical Discovery Research Week in August. The Medal, named in honour of former SVI Director, Professor Jack Martin, is awarded annually for the best MD or PhD student thesis from the St Vincent’s campus submitted in the preceding year. Dr Ascher received the Medal and a $5,000 prize for his work on the structural studies of proteins involved in memory. He is currently doing his postdoctoral studies in the lab of Professor Sir Tom Blundell at the University of Cambridge, focusing on designing new drugs to stop the spread of cancer. Dr Lorien Parker, a former SVI PhD student and past recipient of the TJ Martin Medal, has recently arrived back in Australia to work with Professor Michael Parker in the Structural Biology Unit. Lorien spent the last 4 years at RIKEN Laboratories in Yokohama, Japan. A member of the structural biology team led by Shigeyuki Yokoyama, Lorien’s studies were focused on designing new inhibitors of human cancers as well as inhibitors for proteins involved in metabolic disease. Lorien says that one of the highlights of her time away was a collaboration with JAXA, the Japan Aerospace Exploration Agency, which involved sending her experimental samples to space. Lorien says, “Interestingly, the no-gravity environment our samples were subjected to for the three months they were in orbit produced higher quality data than achieved for the same samples that remained grounded on earth.” Lorien is looking forward to continuing her research with her feet firmly planted on the ground in Melbourne. SVI’s Dr Stuart Mannering and Professor Tom Kay have been in the news thanks to their research published recently in the journal Diabetes. 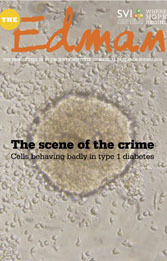 The team’s paper describes how they were able to catch the immune cells responsible for type 1 diabetes ‘at the scene of the crime’ – in the pancreas of an organ donor who had died due to complications of the disease. Type 1 diabetes occurs when the body’s immune cells mistakenly destroy its insulin-producing cells, which are found in the pancrease in clumps of cells called islets. Prior to the SVI team’s research, the immune cells that caused the disease in humans had not been directly studied and it was not known exactly what components of the islets the immune cells targeted. The team studied a pancreas from an organ donor who had type 1 diabetes. Because the donor had been relatively recently diagnosed, the immune destruction of his islets was not complete. “When we were told that the pancreas was available, we weren’t even sure that we would be able to harvest any islets. A normal human pancreas has around 100,000 islets; we purified only about 1,000 islets from this pancreas,” says Stuart. The researchers then started trying to figure out exactly what component of the insulin-producing cells had attracted the immune cells in the first place. They showed that a large number of the immune cells recognised a particular portion of the insulin molecule itself. They now hope to eventually be able to teach the immune system that this component is not “foreign”, and to stop destruction from occurring in the first place. The researchers are now focusing on the blood of people with type 1 diabetes. “If we were in court, the defence would argue that our case is circumstantial. We need to extend our study of the ‘scene of the crime’ to understand motive and then develop prevention strategies. Our next step is to purify the cells from the blood of people with newly diagnosed type 1 diabetes and those at risk of developing it,” says Stuart. Dr Sophie Broughton has recently been awarded the Christina Fleischman Memorial Award for Young Women Investigators from the International Cytokine and Interferon Society, for notable contributions to cytokine research. The Award is based on Sophie’s research, which she has recently published in the journal Cell Reports, along with colleagues from SA’s Centre for Cancer Biology (CCB) and global biopharmaceutical company CSL Limited. The research defines precisely how a newly developed therapeutic antibody, CSL362, binds to Acute Myeloid Leukaemia (AML) cells. Once bound, the antibody is able to recruit the body’s own immune system to kill the cancer cells, potentially preventing relapse of the disease. The article focuses on the 3-dimensional structure of the antibody bound to the interleukin-3 (IL-3) receptor. AML cells, in contrast to most normal cells, express high levels of the IL-3 receptor and this provides an opportunity to target and specifically kill the cancer cells. Sophie used her expertise in understanding the three-dimensional structure of proteins to produce the results. “We determined the structure of the antibody bound to the receptor using data collected at the Australian Synchrotron, a giant X-ray microscope located in Clayton. This structure provides us with a detailed snapshot that reveals how the antibody interacts with the IL-3 receptor at an atomic level, and allows us to understand the effect occurring on leukaemic cells,” Sophie says. Doing research into a rare disease is not for the faint-hearted. From convincing peer-review panels that the research will have enough impact to justify the investment of taxpayer dollars, to the challenges of recruiting enough patients for a clinical trial into a potential drug treatment, scientists who embark upon research into rare diseases face a number of additional hurdles. If a disorder affects less than one in 2,000 people, it generally fits into the rare disease category. SVI’s Carl Walkley says that around 80% of rare diseases are caused by a genetic mutation, and this is what piques his interest. Rare disease research can have surprising collateral effects. For example, study of a disease called Tangier disease, which affects less than 100 people worldwide at any time, resulted in an understanding of how cholesterol is shuttled in and out of the cell. This research is the basis of new treatments that are now being trialled to reduce the effects of heart disease. Carl’s recent work has focused on two rare diseases: osteosarcoma, an aggressive tumour of bone that most commonly affects teenagers, and Rothmund-Thomson syndrome, a cancer condition so rare that it affects only one Australian family. In a paper published in the prestigious Journal of Clinical Investigation, Carl and his team explained how the gene Recql4, which causes Rothmund-Thomson Syndrome in humans, is involved in normal blood cell development and maturation. Knowledge about the essential role of Recql4 in blood development may help understand the progress of other diseases where blood cell development is disrupted, such as aplastic anemia and myelodysplastic syndrome. In research published in the journal Oncogene, the team showed that they were able to influence the ability of osteosarcoma tumour cells to multiply by manipulating signaling through a protein known as the parathyroid hormone receptor. Anthony’s brother, Andrew, was diagnosed with bone cancer when he was 16. “My 16 year old brother, Andrew, was diagnosed with osteosarcoma in February 1995. He was a typically active teenager who grew up idolising the Hawthorn football club. He played lots of sport so when he complained of a sore knee my parents weren’t too concerned. When the pain increased in the next couple of weeks, my dad took him to see our GP. He said Andrew was experiencing growing pains and that it should pass. Over the next week the pain in his leg became worse and was accompanied with redness and swelling. Eventually an orthopaedic specialist took x-rays and sent them to a surgeon. We were then told that Andrew had a malignant bone tumour called osteosarcoma and the chances of survival were around 75-80%. The surgeon seemed quite positive but the initial diagnosis floored us. We had never heard of osteosarcoma but soon found out it was most common in teenagers. When you hear the word ‘cancer’ your natural reaction is one of fear. My brother and I were close and played a lot of sport together so one of my first reactions was worrying about whether Andrew would be able to play competitive sports again. My parents were very courageous and tried to keep a positive frame of mind, even though at times this was tested. They also had three other kids in primary school so it was a juggling act to make sure we were taken care of as well. Andrew had a bone graft operation that involved replacing his knee with a donor bone, meaning he would no longer be able to run around. After receiving this news, he had to endure months of chemotherapy. It is very hard to watch people go through something like that and when that person is your own brother, it is 100 times as difficult. Unfortunately, 6 months after Andrew’s diagnosis we were told that the cancer had spread to his lungs. Within a year he had passed away. I hope that one day more advanced and less invasive treatments and even cures are found. It is very encouraging to hear that research is being conducted on osteosarcoma. I would like to think that more advances have been made since my brother’s death and that no-one else would have to endure what he and others have gone through. Andrew is very much still close to our hearts and I know he would be extremely grateful for the research being undertaken at SVI in the hope of one day finding a cure. Students from Genazzano FCJ College found out about life in research on their tour of SVI on the 18th of July. The students were welcomed by Tom Kay and then separated into groups to find out more about research at SVI. The groups learnt about research into type 1 diabetes from Dr Tom Brodnicki; drug design from Dr Jess Holien and heard from PhD students Vy Hoang and Ashleigh King about their PhD projects and what attracted them to a career in research. The Rolls Royce Club of Victoria, the RACV Club and members of the SVI Support Group also recently toured the Institute. The SVI Support Group celebrates its 20th Anniversary this year with their annual dinner at the Athenaeum Club in October. The Group has been responsible for raising more than $280,000 to help fund Student Scholarships at SVI. Thanks to their generosity, more than 27 Honours and 30 PhD students have been supported by Top-Up Scholarships. SVI would like to thank all those who have donated to help support students over the years and especially to acknowledge the hard work of the SVI Support Group, whose outstanding long-term support of SVI is greatly appreciated. Point Lonsdale locals and SVI supporters joined Professor Tom Kay on an evening in August on the Bellarine Peninsula to hear from Nobel Laureate Professor Peter Doherty about his passion for research. In front of a roaring fire, Professor Doherty spoke of the importance of medical research and the role that Melbourne plays as a global hub for leading-edge researchers. Guests also heard from Jessica Martin, a PhD student studying the effects of anaesthesia on children. The evening, organised by local supporter Marylou Gilbert, proprietor of The Bookshop at Queenscliff, raised $2,000 in support of SVI research. Thanks to Louise Gourlay for hosting the evening and to Terindah Estate Winery for their sponsorship of the event. utes, SVI, The Walter and Eliza Hall Institute and Baker IDI. As in previous years, guests were entertained with a wonderful line up of entertainment including Samantha Jade, Mark Vincent and The Melbourne Symphony Orchestra Chorus, Prinnie Stevens and Mahalia Barnes and the Phil Ceberano Band. Benni Aroni, Vice Chair of the SVI Foundation, was presented with an award on the night for his outstanding contribution to medical research. The evening was a huge success, with funds to be distributed to the three recipient Institutes to support research into type 1 diabetes. SVI sincerely thanks Sue for an unforgettable evening and her ongoing commitment and support towards medical research. Medical research and racehorse training may seem poles apart, but SVI owes a special debt to Melbourne’s horse-racing tradition. SVI was established as a result of a generous bequest from racehorse trainer Jack Holt (who was known as ‘The Wizard of Moordialloc’). Holt’s life was devoted to racing, and he was one of the most successful Australian racehorse trainers of the early 20th century, training winners in the Melbourne Cup, two Caulfield Cups, six Cox Plates and a Victorian Derby. In a career lasting until 1948, Holt trained some one thousand winners, earned an estimated £500,000 stake-money for his clients and was dubbed ‘the most famous of all Australian racehorse trainers’. Jack lived his entire life together with his two sisters, Margaret and Catherine in a small 8-roomed cottage in Mordialloc. While his business acumen and skill as a trainer led to the development of a rather large fortune, above all Jack was known for his good humour and generosity. The death of his beloved sister Catherine in 1945 provoked him to consider how best to bequeath his assets. Invalided after a heart attack in 1948, Jack Holt died of coronary occlusion on the 10th June 1951 and left the bulk of his estate (£200,000) to establish what is now St Vincent’s Institute. To honour Jack’s legacy, the Rotary Club of Brighton is holding The Inaugural Jack Holt Charity Breakfast on Friday 24th of October at the RACV Club, from 7-9 am. Visit the Rotary Club of Brighton website for more details and to book. When you choose to leave a gift in your Will to SVI, the whole community benefits. Your generosity will provide a source of funds that will allow us to continue our important research. You can direct your Bequest to the area of research you wish to support. Just imagine, your Bequest could advance the cutting edge work of a scientist; purchase vital equipment to speed up discovery; or help develop a drug to treat Alzheimer’s disease. For us, the supporter, the scientist and the discovery are all critical steps on the pathway towards a healthier future. Contact Madeleine at [email protected] or on 03 9231 2480 for a confidential discussion.